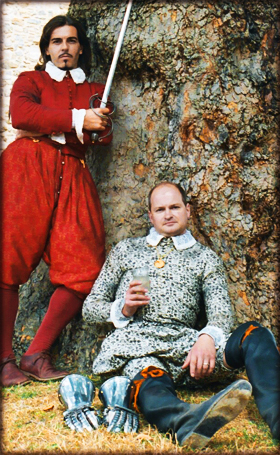 Two Elizabethan knights created for Historic Royal Palaces at their "Gloriana" event, celebrating the reign of Queen Elizabeth I. Thirty days of thrilling real foot combat, the first of its kind in four centuries. "I just wanted to say an ENORMOUS THANKS for everything you did on Ever Wondered About Food. Not only were you professional, thorough and very easy to work with, you also went far outside the call of duty with your research and guidance. Thanks again. It is very much appreciated." "Thanks for all your help on the shoot… we're so excited and can't wait to start editing! Sorry to add so much stuff at the last minute (like the Ark!) and putting things together so quickly. Everything looked amazing, and we totally got all the shots that we wanted in the short time. Thank you!!! Will be forever grateful. Please thank everyone on the team for us as well. Hope to get you on other gigs too, you guys are so great." "I’ve never used stunt people before. I hope they are all as good as you." "I just wanted to thank you again for everything you did on 'William the Conqueror'. I really appreciate your hard work and great 'can do' attitude. The footage we came back with looks great. Thanks again for doing a dozen jobs..."
"I really enjoyed working with you and found your whole approach and 'craft level' genuinely superb... and you can't say more than that. I'd be very happy working with you again and look forward to the opportunity. We are getting rushes delivered tomorrow morning - and from all accounts they look great! Thanks again for all you did to make the shoot both possible and successful." "I just wanted to reiterate my thanks to you for all your hard work on my reconstructions... I was really delighted with the way they turned out, and your good humour in the face of no budget and no time was exceptional!" "I just wanted to add my penny's worth! You, Jeff, Elizabeth and Constance were terrific. It was a pleasure working with you all. I can't believe how inventive you are: 13th Century wall here, 16th century rocking-chair there! Amazing. Anyway, I can't thank you enough but I do hope I have the pleasure of working with you again soon." "Many thanks for your time and expertise during filming. It was a pleasure to meet you and your expertise is very much appreciated." "…a very big thank you for your time and professionalism during our shoot. The entire shoot was a huge success, largely due to the expert help and co-operation that we received from your good self. Thank you for your professional conduct in assisting us with our production, it was appreciated by all." "Thank you for all your help on the Time team shoot last weekend. The fishing was definitely one of the highlights. Both Mick and Tony really enjoyed it, especially Mick, considering his academic interest in the subject." "Thank you for your assistance and participation in the documentary. Your contribution was immeasurable - we could not have done it without you. Your all-round expertise and quick-witted resourcefulness made our work in England seem easy." "Your knowledge and great rapport with the students brought history alive for them and they are still discussing the event. We wanted the students to have the opportunity to experience different aspects of the curriculum and your visit was both educational and effective in allowing the students to have a new experience. It certainly allowed them to appreciate history in a new light. Thank you once again for your superb visit." "The day went very well and it was clear the boys really enjoyed listening to you. They particularly enjoyed the ‘hands-on’ stuff, and were very proud of their authentic signatures written with a genuine quill!" "Thank you so much for all the effort you put into making our history day so successful. The children really enjoyed your talks and they have been inspired to do their own research." "The staff and children have all told me very enthusiastically how much they enjoyed the visit. Year 5, who are studying the Tudor period this term, have been stimulated greatly by your visit." "You deserve a very big thank-you for all the hard work you put into last weekend's event. The whole thing was most professional… a resounding success. Very many thanks for all your dedicated work." "Thank you so much for coming to help, particularly as the arrangements had to be altered at the last minute. I was so grateful for your efforts and that you found the day as interesting and rewarding as we did. I know your display was much appreciated by our visitors." "We heard many positive comments about the Tudor soldiers. The quality of interpretation was extremely high and was obviously a hit with the public." "Thank you for your contribution to the open evening, it was a resounding success - 1,350 people through the doors, who all had a very enjoyable evening!" "Thank you for all your sterling work on the event... this was judged a great success and a real innovation by everyone who saw it. I think it hit the mark for what our visitors really wanted. It is quite incredible to think how much work you put in over such a short span of time." "An excellent piece of interpretation." "My warmest thanks to you and the Griffin Historical team for your work over the past four and a half years. You and the team have made a real contribution to helping us achieve our aspirations for Scotland's historic environment. You have consistently demonstrated the ability to understand and resolve challenges with utmost professionalism, and to devise and deliver solutions which exceed our expectations and those of our visitors." "Kathy and Jeff are bang on, it was a terrific day and the Knight's School worked brilliantly well. Jeff is a VERY loud man and had the children and adults in stitches; they both worked their socks off and we were incredibly impressed, so thank you very much indeed, we’d love to have you/them back. It really was a cracking event, we are thrilled." "A short note to thank you very warmly for all your hard work and expertise that you put into making the event such a success. Well done!" "On behalf of the British Library, and our sponsors and partners in the Magna Carta Unification project, I would like to thank you and your brilliant team for your incredible contribution to our celebrations. You were a huge part of the success of the day - not only providing entertainment and historical expertise for our visitors, but being central to the smooth running of the event. As organiser, I greatly appreciated the peace of mind you gave me, knowing you were expertly guiding our guests – and we have had many extremely positive comments since the day from public and partners. I would also like to thank you all for your tireless enthusiasm, ideas and good humour throughout the whole project from planning to delivery." "The people that came to see your performers were very impressed with what they saw... they made a very good medieval atmosphere." "What can I say? thank you so much for all your hard work making the Tower of London corporate day such a great success. The feedback is all positive, and everyone spoke very highly of your entertainers and were very impressed with their knowledge and passion for history. I personally cannot thank you enough for making the day run so smoothly, everyone worked so hard and it was amazing how quickly it all fell into place, and was also dismantled. The children all had such fun with the circus skills and the archery/crossbow was a very great success. I very much hope that we can work together again in the near future." "I must thank you and all your fellow players and falconers for the marvellous way you handled our garden party at Hampton Court. You managed to pitch the entertainment at exactly the right level, and people thoroughly enjoyed themselves. I must congratulate the falconers, I have heard nothing but the highest praise for their amazing display." "Thank you for all your fantastic efforts on the 27th June party. We really did appreciate it." "Bernard Cornwell enjoyed it - which is the most important - but so did all our guests, and your decor and people gave his MBE celebration party a special feel which was so important. You had to work very hard setting up and taking down and I know it was a late booking in a very busy period, so especial thanks." "Many thanks for all your help with the launch of The Other Boleyn Girl. Your actors just made the event, and the readings were fantastically in character, and everything was fab!" "Griffin Historical played an important part in contributing to the medieval theme of the event and the feedback we have received from visitors, officials and the press has been fantastic. 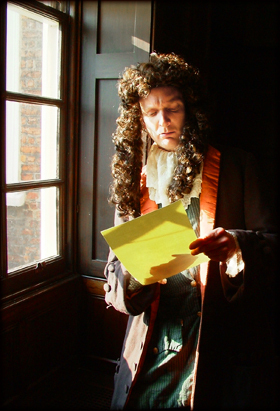 Everyone was so impressed with what they saw and learned - as well as being thoroughly entertained - and that was in no small way due to the professionalism, expertise and input from all members of Griffin Historical." "Just a short note to say thank you for all your hard work on the Christmas event. I am very confident that we produced a top-notch historical event, which ticked all the boxes imaginable, and was above all tremendously enjoyable for participants and public alike. "Regardless of the limited preparation time, and the unfamiliar historical period, you were a very real character. As usual, it was an inordinate pleasure to work with someone in whose innate sense of theatricality, timing, flexibility and attention to detail we could place so much trust. We also appreciate your generosity with regard to 'spare' props and costumes: it got us out of something of a budgetary hole!" "I'm writing to thank everyone - for being absolute troopers and presenting a rattling good show despite the rain. The National Trust were extremely pleased with the show, which I understand went very well."